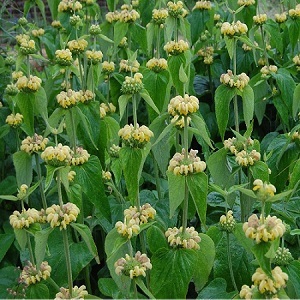 Phlomis is a decorative, long flowering plant with grey green leaves and tall spikes of yellow/gold flowers from May/June to September. These are great border plants, growing well in the middle of a border in groups. They are well suited to dry or Mediterranean gardens. Plants grow to a height of 90-100cm when in flower and attract pollinators into the garden. Turkish Sage grows best in full sun to part shade and well drained soil. The plants die back in winter, but the dried material looks great in the frost, and can be cleared away in spring when the plants start to re-grow. They are drought tolerant once established. Pack of 25 seeds. Sow the seeds over winter into early spring outside, and seeds germinate irregularly over several months. Sowing instructions and a colour photo are printed on the packet. Sow Sow in winter in a tray of compost. Cover the seeds lightly with compost and leave outside with a clear cover. Keep the seed tray moist and the seeds germinate when the weather warms up. Germination is irregular and takes several months, so be patient and sow more than you need. Transfer seedlings to small pots when they are big enough to handle and then out into the garden. Grow Plants die back in winter, when they can be tidied up. Flowering starts in the second season. Cut back the plants after flowering. Or leave the dead material on the plant over winter, as it is attractive covered in frost, and remove in spring. Plants start growing again in spring. Mature plants can be divided in spring.